Pange lingua gloriosi is a Corpus Christi hymn written by St Thomas Aquinas who died in 1274. In the Liber Usualis it is prescribed as a processional hymn at Mass on the Feast of Corpus Christi and it appears in the English Hymnal as a communion hymn. 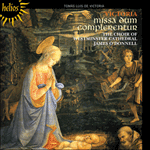 Victoria’s four-part alternatim setting, also part of the 1581 collection, makes use of all six verses of the hymn, with the plainsong again being utilized as a cantus firmus in the tenor and then the soprano parts. The last verse, unusually, breaks into a lively triple time and ends with a beautifully ornamented Amen. Pange lingua gloriosi est une hymne de la Fête-Dieu écrite par saint Thomas d’Aquin, mort en 1274. Le Liber Usualis la prescrit comme une hymne processionnelle lors de la messe de la Fête-Dieu. La mise en musique alternatim, à quatre parties, de Victoria appartient également au recueil de 1581 et utilise les six strophes de l’hymne, le plain-chant revenant, ici encore, comme un cantus firmus dans les parties pour ténor puis pour soprano. La dernière strophe embrasse une insolite mesure ternaire, vivante, pour s’achever par un amen magnifiquement orné. Die Hymne zum Fronleichnamsfest Pange lingua gloriosi stammt aus der Feder des 1274 verstorbenen Heiligen Thomas von Aquin. Laut Liber Usualis ist sie eine Prozessionshymne für die Fronleichnamsmesse. Victorias vierstimmige Alternatim-Vertonung, die auch zur Sammlung von 1581 gehörte, erstreckt sich über sämtliche der sechs Hymnenverse, und wiederum erschallt der Gesang als Cantus firmus—zuerst in der Tenorstimme, dann in den Sopranstimmen. Dennoch bricht der letzte Vers ganz ungewöhnlich in einen lebhaften Tripeltakt aus und endet in einem wunderbar verzierten Amen. Cibum turbae duodenae se dat suis manibus. Ad firmandum cor sincerum, sola fides sufficit. of a noble womb, shed as ransom for the people of the world. having dwelt his life here he duly concluded it with a wonder. then, with his own hand, gave himself as food to the twelve. faith alone will be sufficient to strengthen the true heart. let faith provide its help where all the senses fail. to the one who proceeds from both be given equal praise. Amen.